One day after voicing his displeasure about his playing time in Montreal, Mike Cammalleri is headed back to Calgary. The Flames acquired the 29-year-old forward from the Canadiens on Thursday night along with goaltender Karri Ramo and a fifth-round pick in the 2012 NHL Draft. In exchange, the Canadiens received forwards Rene Bourque and Patrick Holland, plus a second-rounder in the 2013 draft. Cammalleri played 9:02 during the first two periods of the Canadiens' 2-1 loss at Boston on Thursday, but was sent to the dressing room and did not play in the third period. His ice time had been cut in recent games, noting after he played 15:01 in Tuesday's 3-0 home loss to St. Louis that, "I'm used to playing 20 minutes a night." He's likely to get that opportunity with the goal-famished Flames. "I think Cammy was a frustrated hockey player... it's a difficult situation," Flames GM Jay Feaster said after the first period of his team's home game against Anaheim on Thursday. "It's a marketplace that's very demanding." The Richmond Hill, Ont., native signed a five-year contract with the Canadiens in the summer of 2009 after scoring 39 goals and 82 points with the Flames in 2008-09. Cammalleri scored 26 and 19 goals in his first two seasons in Montreal, but had just nine goals and 22 points in 38 games with the Canadiens this season. However, he became a playoff hero in Montreal by scoring a League-high 13 times in the Canadiens' run to the Eastern Conference Finals in 2010, and had 10 points in last spring's seven-game loss to Boston in the opening round. He told RDS that he's glad to be going back to a place where he enjoyed playing -- and where he's more likely to be involved in a playoff race. "Getting traded is never something you look forward to, but I have fond memories of playing in Calgary," he said. "I really enjoyed my time there, I have some very good friendships in Calgary. I know Calgary – I guess I can say ‘we’ now, it’s weird – is four points out of a spot right now and playing tonight. I’m looking forward to being part of a solution there." Cammalleri also told RDS at the team hotel in Boston that after watching coach Jacques Martin get fired last month and seeing no improvement in the team's fortunes, he had an idea that some changes in player personnel could be coming. 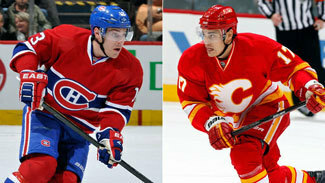 "I'm not completely surprised just because we are in the business of performing and winning," Cammalleri said. "We were all on alert, and sometimes this is what happens in our business." Both general managers -- Jay Feaster of the Flames and Pierre Gauthier of the Canadiens -- said the trade had been in the works for a while. "There's an excited hockey player coming to Calgary, and a guy who is ready to jump into that playoff race." Gauthier said he'd been working on potential deals, including this one, since around Dec. 1. Bourque's size -- he's listed at 6-foot-2 and 211 pounds -- was a key consideration as Gauthier looks to add muscle to a speedy-but-small team. "We've been trying for all those weeks to try to get bigger up front," said Gauthier, who added that the only thing holding up the deal with Calgary was a five-game suspension to Bourque, which has just one game left. "We felt as the season started that was one of the things [we needed]. We have a lot of young players that have joined the team in the last year or so, and then Mr. [Raphael] Diaz this year, that are not very big. We felt that if we want to improve the club, we need to be bigger up front." Gauthier said Cammalleri never asked for a trade. "The whole team's performance is disappointing," Gauthier said of the Canadiens, who are 16-20-7 and 13th in the Eastern Conference. "Whether it's the veterans or the young kids and everything, it's been a hard season and we're feeling it. This is not about trading Mr. Cammalleri. This is about improving the club and obtaining a player that we feel is of a different profile and will help score as many goals, will score different kind of goals and make us bigger. We all know that's something we needed to address." The Flames have struggled to score -- they needed an overtime goal to beat Anaheim 1-0 on Thursday -- and though Cammalleri never put up the kind of numbers in Montreal that he did in Calgary, his former team is glad to have him back. "We need a more dynamic offensive threat, and that's what Cammy brings," Feaster said. "We need his presence on the power play." Coach Brent Sutter is also eager to add Cammalleri to his lineup. "He's gonna play hard and he's got fire in him," Sutter said after the Flames beat the Ducks for their eighth consecutive home win. "He's going to be a real good fit, and we're excited about having him." Cammalleri's contract is worth $6 million this season and $7 million in both 2012-13 and 2013-14, according to CapGeek. His cap hit is $6 million. Bourque is in the second year of a six-year, $20 million deal. Bourque, 30, has 13 goals and 16 points in 37 games for Calgary. He is currently sitting out a five-game suspension for elbowing Washington's Nicklas Backstrom in the head last week. Bourque had 27 goals in each of the last two seasons for the Flames. "It's the hardest part, saying goodbye to good friends you've played with," Bourque told the media at Scotiabank Saddledome. "You want to win with teams you play for. We've had a tough couple of years here. They wanted to make a change. I don't know if they wanted to get rid of me but you get Cammalleri back it's a pretty good deal. You get a good player in return. I'm going to do my best to help them out. "I heard Cammy was taken off the ice, so when I got pulled aside I had a good idea. It's a big shock. I had no idea this was going on. But if there's anywhere I want to play, it's Montreal." Ramo, 25, was acquired by Montreal from Tampa Bay in August 2010. He was taken by Tampa Bay in the sixth round of the 2004 NHL Draft and was 11-21-10 in parts of two seasons with the Lightning before opting to play in the KHL with Omsk Avangard. Holland, 20, was a seventh-round pick by the Flames in the 2010 draft and had 22 goals and 62 points last season with Tri-City of the Western Hockey League. He has 17 goals and 40 assists for 57 points in 40 games so far in 2011-12.